The Wildcats salute the crowd following their BNC clinching win over TC Central. 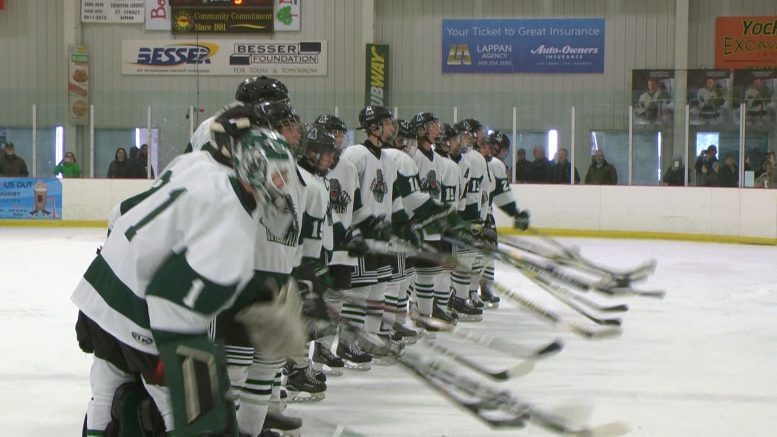 Alpena, Mich — The Wildcat hockey team hasn’t brought home a Big North Conference title since 2005. Following their win over Cadillac Friday night, Alpena found themselves in a position to claim the throne. All they needed was one more conference win. As the Wildcats prepared to host Traverse City Central, the fans recognized junior Alec Kent and senior Taylor Agius. Kent is moving and will not play at Northern Lights Arena as a Wildcat again, while Agius has opened the games by singing the national anthem. Alpena’s Colby Plowman scored a short handed goal in the first period to give the Wildcats the only win they’d need. He intercepted a centering pass and took it coast-to-coast for the goal. The Wildcats opened the second period on a power play and delivered. Senior Owen Limback scored his second goal in as many games for a 2-0 lead. Senior captain Kyle VanDusen scored twice and senior Keegan Mathews also added one as well. Cooper Black was brilliant in the goal, though Evan Kraenzlein was instrumental in orchestrating the shut out. Kraenzlein swept away a potential tap in goal during the second period. 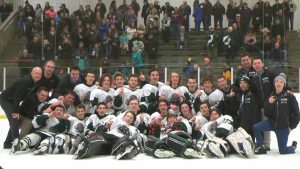 Friends, family, and fans all stormed the ice following Alpena’s salute to the crowd. The 5-0 victory is a fitting finish for Alpean’s final game at Northern Lights Arena this seasson. Alpena has one final regular season game on their schedule before starting district play. The last game is at Traverse City West on Wednesday. Districts begin on the 25th at the Ostego County Sportsplex in Gaylord. They’re currently slated to face Sault Ste. Marie, who they defeated 5-1 earlier this season.